Indian Ministry of Defence is hosting the 10th DefExpo in Chennai (April 11-14). Unlike the previous editions, which had more participation from foreign players, this year state-run and domestic companies are set to get their due recognition. The 2018-series DefExpo tag-line — India: The Emerging Defence Manufacturing Hub — says it all. The government wants to showcase its Public Sector Units (PSUs) like Hindustan Aeronautics Limited (HAL), Defence Research and Development Organisation (DRDO), as well as private domestic firms like the Kalyani Group and aero-components-makers Tata Advanced Systems Limited to the world and become a new export hub for military equipment. The Dhruv comes with composite hinge-less interchangeable main rotor blades, composite bearingless tail rotor blades, a composite airframe, a glass cockpit with an Automatic Flight Control System (AFCS), a Chaff & Flare dispenser (for heat-seeking missile distraction routines), an Integrated Self Protection Suite, a health and usage monitoring system, a Helmet Pointing System (HPS), a digital video recording system, an InfraRed (IR) suppressor, and an onboard Inert Gas Generation System. Depending on the utility, it can be fitted with guns and rockets as well. Though it is developed and manufactured by HAL, it was designed with the assistance of German aerospace company Messerschmitt-Bölkow-Blohm (MBB). The Dhruv comes in four variants — ALH Mk I, ALH Mk II, ALH Mk III and ALH Mk IV — and is serviced in different roles and capacities. The Dhruv civil variant is used to carry Very Important Persons (VIPs). Some private companies, too, have purchased them to carry passengers for short-range trips — mostly in tourist locations, cities and sea harbor ports — for quick access to airports. Dhruv variants have also been used for providing logistical air support, causality evacuation, and search and rescue. 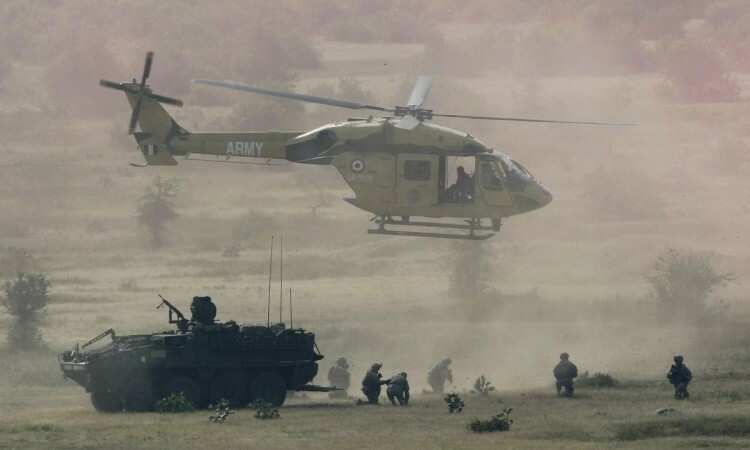 On military missions, the Dhruv is used for carrying underslung loads (ammunitions or equipment) for the army in war, rapid deployment of forces and also for Air Force training. Thanks to its multi-role capability, the Dhruv is in service with all three defense forces — Indian Army, Indian Air force and Indian Navy. Four ALH Dhruv choppers are also being used by Indian Air Force's 32-airman Sarang aerobatic squad, which is touted to among the world's top three helicopter daredevil teams. As of now, more than 200 Dhruvs are operating with the Indian Defence Forces. HAL is in the process of delivering 159 Dhruv helicopters to Indian Army & IAF. HAL also received orders in 2017 from the Army, Coast Guard and Navy for 73 ALH Mk-III & Mk-IV variants. HAL has already supplied different Dhruv variants to the Nepal Army, Mauritius Police and Maldives. HAL's civil customers of Dhruv include Oil & Natural Gas Corporation Ltd (ONGC), Geological Survey of India (GSI), the government of Jharkhand and paramilitary force (like BSF). Armed variant for Attack, Close Air Support, and High altitude operations. Light Combat Aircraft (LCA) Tejas, Light Combat Helicopters (LCH), nuclear-capable missiles such as Dhanush, Akash, Indo-Russian BrahMos, the 155mm-class howitzer Advanced Towed Artillery Gun (ATAG) from DRDO and Kalyani Group and more are confirmed to be showcased at DefExpo 2018. In the run-up to the next month's DefExpo 2018, we will be pushing a series of reports on individual military equipment and aircraft with their features.